Nature with attitude: new exhibition by Julia Manning RE Throughout August, The White Lion Street Gallery in Tenby will exhibit the work of Julia Manning RE, a painter and printmaker from Somerset who has a passionate interest in the natural world. She is inspired by the wide views across the Levels near her home, the UK's coastlines and cliffs, the islands of Skomer, Skokholm, Bardsey, Farne and Anglesey as well as travels to wilder, more remote areas of the world. From frequent observation of native and visiting flocks of birds in her local quarry Julia documents their life and in her own garden she is provided with intimate vignettes of nesting birds and fledglings amongst the wisteria foliage outside her studio. Her frequent visits to Skokholm have resulted in her being asked to paint the new landing stage with depictions of Manx Sheerwaters. She picks up fragments of life forms on her walks and travels  a sea bird found on the shoreline, plant life and fossilised remains, stones, shells and driftwood. These find their way into her studio collections, and some to her freezer to be examined later, and then into her art by informing her of fine details, nuanced colour and the mechanics of construction, for example of a bird's wing. Although larger animals have featured in Julia's repertoire, tigers drawn at Longleat, monkeys and elephants in India, birds in particular have become the strongest motif in her work. She is amazed at how such small light delicate creatures can find their way to Africa and back for example, how similar and different each species is, how bizarre and comical their behaviour can seem and sometimes how incongruous their surroundings: A besotted puffin is shown offering his love token of seaweed; a cloud of young ravens is observed doing wild aerobatics to impress and find their lifelong mate; black backed gulls appear to be hiding amongst bracken and bluebells; and all the rituals of mating, maintaining territory, getting food, nesting and hatching form Julia Manning's oeuvre.... Julia studied fine art at Bath Academy of Art and for over 30 years earned her living with a paint brush. From portraits to trompe l'oeil, from murals to painted tapestries, she undertook commissions from all round the world. Now she focuses on her work as a printmaker, her skill being recognised by awards - such as The Fenton Arts Trust Award 2008, The RE award and three others in the same year, The Printmakers' Printmaker of the Year in 2009  and by purchase for public collections eg. The House of Lords, Aberystwyth print Archives, the British Embassy in Paris. 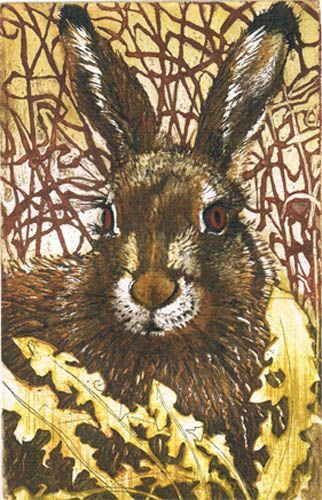 Julia has exhibited her work all over the UK in various one-woman shows during the last 10 years and is a frequent contributor to the exhibitions of The Devon Guild of Craftsmen, the Somerset Printmakers, The Society of Wildlife Artists and the Royal Society of Painter-Printmakers. Julia makes prints in a range of complex traditional methods: etching into copper plate, engraving into endgrain wood, incising wood planks or ply panels, cutting lino and constructing collages to make collographs  and then pushes the boundaries by using multiple plates, or combining methods, or using the âsuicide' method of lino cutting. (Please note these prints are handmade and original  not reproductions.) She is continually experimenting with the materials and methods to make richly textured prints, some of huge size, and some made in collaborations with other artists. Three panels of recent collaborative wood block work, large sea and cliff scenes, will be shown in the exhibition and an article in Printmaking Today magazine celebrates the âfamous five' who undertook this venture at Hartland. Recognised by her peers, avidly collected by her admirers, Julia produces high quality work combining technical skill with close observation of the natural world injected with a sense of humour or drama. These are not sentimental scenes with wildlife: it's nature with attitude. Julia Manning's exhibition at the White Lion Street Gallery will start on Friday 1st August and continue until the 28th. The gallery is open from 10am to 5pm every day except for Wednesday, and everyone is welcome. View the website www.artmatters.org.uk or telephone 01834-843375 for any further information.